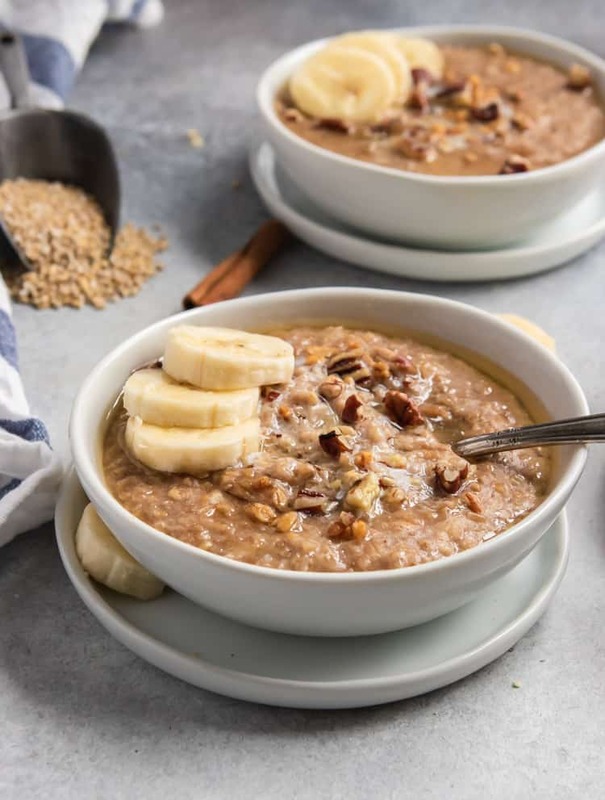 These Banana Bread Instant Pot Steel Cut Oats are full of flavor with a hint of brown sugar, cinnamon and all the creamy goodness you want in a big healthy bowl of oatmeal, and are ready in no time! 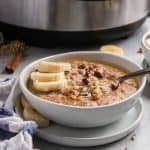 You Need Instant Pot Steel Cut Oats! This oatmeal recipe may very well be the try-fecta of greatness. It has three of my favorite things all wrapped up into one perfect breakfast. What are they? 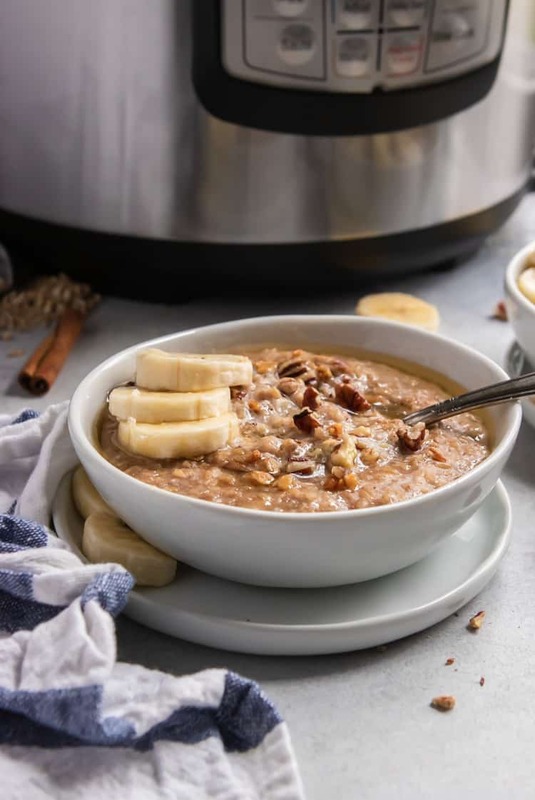 Banana Bread, oats, and the Instant Pot. Can’t beat this one, my friends–couldn’t come up with anything better if I tried! Guess that means this is the peak for me! Ha. 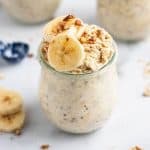 My Banana Bread Overnight Oats are one of the top 3 recipes of all time on the blog and for a reason. It is soooo good but even better, soooo simple! When I started out on my overnight oats kick, I remember reading that using steel cut oats was an option. Ha, I would love to meet the people who do it that way because steel cut overnight oats are the chewiest, not soft oats I have ever eaten. THAT is not how I do overnight oats. Sorry! And that, my friends, is where the Instant Pot comes in. It took me a loooong time to jump on the Instant Pot train. I kept hearing people swear by it, but I was not buying it. First, there was no way I was gonna convince my husband that I needed yet another kitchen appliance–especially one that takes up a decent amount of space. And two, I was so crazy in love with my slow cooker–how could I abandon it?? But my ears perked up one day when a friend mentioned you could also slow cook using the Instant Pot. To say I went out and bought one that day sounds dramatic, but hey, it adds to the story right? I was told that steel cut oats in the pressure cooker are next level so that was one of the recipes I was eager to test. And I couldn’t think of a better flavor to kick it all off with than Banana Bread!! 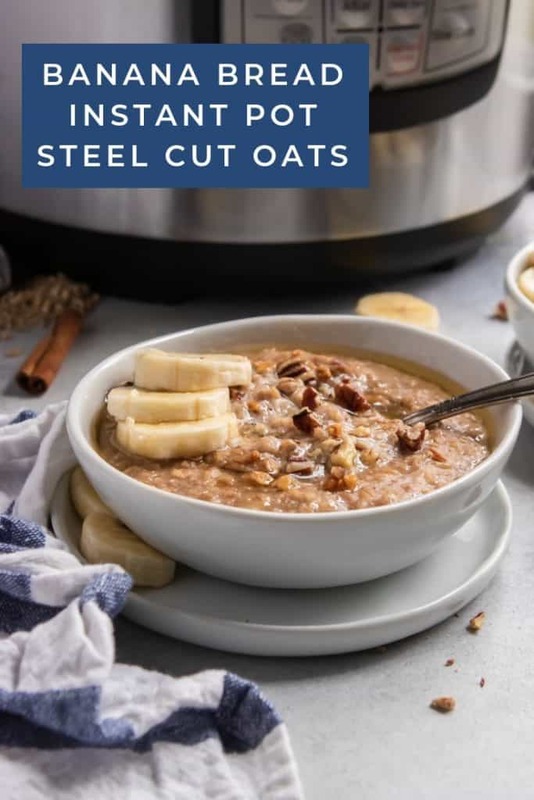 Instant Pot Steel Cut Oats are about to rock your breakfast world! I was wildly surprised by the results of steel cut oats in the Instant Pot. Creamy and hearty and just pure deliciousness. And with all the effort of dumping ingredients and then waling away for a few minutes. Brilliant??? Indeed! Delicious? Of course! Breakfast in bed coming up? ?–well, that I can’t promise, but I am sure you can drop some major hints around the house. If you are reading this and it’s late, you are going to have sweet banana bread dreams and you will be extra happy when the alarm goes off……ok, that I cannot promise either. Maybe it’s time for me to just stop and give you the recipe. Sound like a plan!? I timed exactly how long it took me to make this once I turned the Instant Pot on and it was almost exactly 15 minutes. This was using manual pressure set to 3 minutes and a 5 minute slow release and then quick releasing. I find that sometimes we say “set to x number of minutes” but that doesn’t take into account the pressure build up. So I timed this start to finish. 15 minutes seems pretty fair for some fresh banana bread oats!! Let’s talk sweetness for this recipe. I love the combo of a touch of maple and a touch of brown sugar. 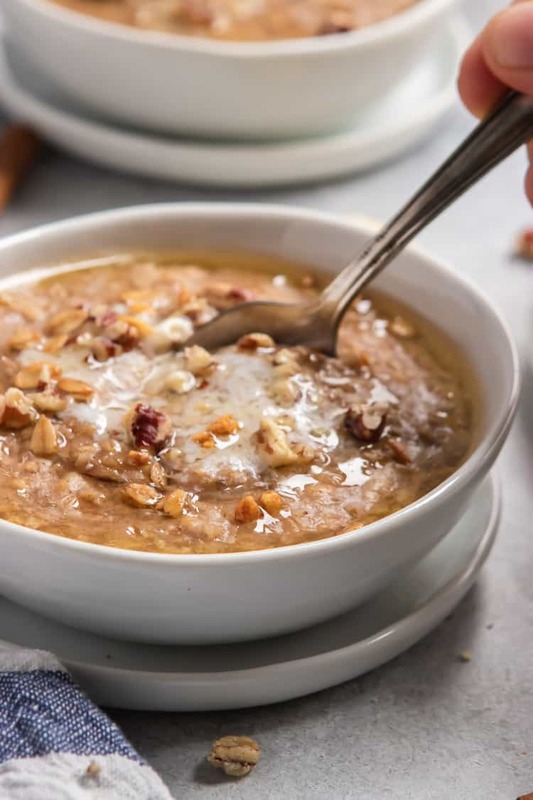 What I have found after reading comments of all of my oat recipes is that the sweetness is the biggest variance of all. Some will be just fine with only the sweetness of bananas while others will want half a jar of maple syrup. That’s why I stayed flexible with the sweetness. Sweeten in the end and do it to your taste! I am sure one thing you may be thinking is, hey, wait a sec, I don’t have any steel cut oats. Now what?? 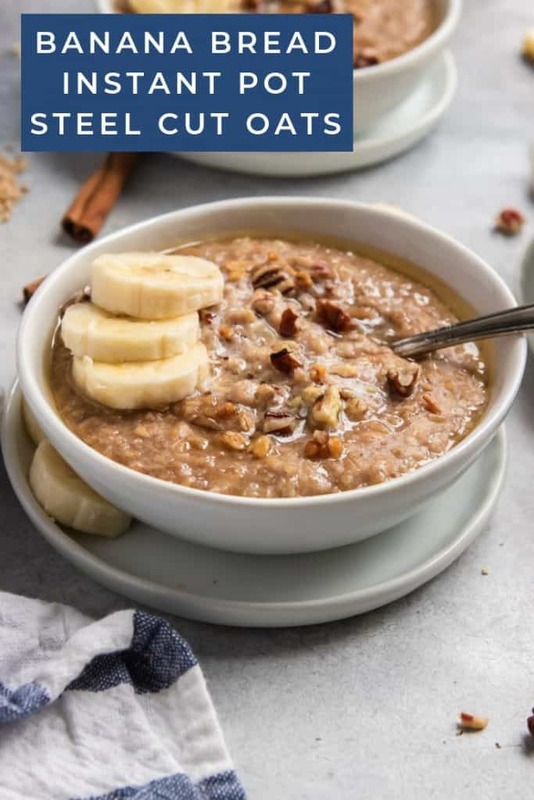 Welllll, you should actually be able to make this same recipe with rolled oats, but will need to cut down on the amount of liquid by one cup. So just use 2 cups liquid and you should be just fine as well. Gluten free? For sure! You can find gluten free steel cut oats. And if you need this dairy free, then use your favorite dairy free milk. 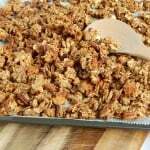 You could even make this friendly for anyone with nut allergies by eliminating the pecans. This recipe is pretty flexible for all! If you really want to enjoy this banana bread recipe in the very best way possible, then make sure to add a bit of butter right before cooking. You will not regret it! Ripe bananas. Always use super ripe bananas for optimal sweetness and easy mashing. Mash bananas in a small bowl. Spray the inner pot of your pressure cooker/Instant Pot with cooking oil. Add milk, oats, mashed bananas, vanilla cinnamon, and sea salt and stir to combine. Close Instant Pot and lock, turn air vent to "Sealing" and set manual pressure cooking to 3 minutes. Allow to cook and once timer is up, allow the oatmeal to slow release for 5 minutes. When 5 minutes is up, quick release any other pressure and open the pot. Stir in brown sugar and maple as well as the pecans. Allow to thicken for several minutes and then serve as desired. I loooooved mine with a touch of butter on top and some extra pecans!